It is sometimes easy to dismiss a film like Mahua Memoirs as activist harangue. After all, it is about the impact of mining on tribal people--not exactly a subject that will draw the multiplex-going public. But there is an ineffable poignancy about Mahua Memoirs that holds your attention once--rather if--you decide to see it. The film documents stories from the mining belt of India. But with a rare charm. The adivasi present their case in Mahua Memoirs. It is difficult to miss the thrust of the argument when a young girl in the Niyamgiri hills, threatened with eviction because of mining, wonders how she will survive in a new area that does not have mangoes, tubers and other local fruits. The film follows Thirku, a Baiga from the Maikal Hills, practising shifting cultivation, and Saloo, a bard. It takes us to some well known--and some not so well known--mining locales. The most infamous of mining cases are there; Vedanta and Kalinga Nagar, for example. Shot in far-flung areas of Orissa, Chhatisgarh, Jharkhand, and Andhra Pradesh, the film races back and forth from 2002 to 2006, and across landscapes, weaving together episodes. Tribal communities, some of the poorest and most deprived people in the country, are ranged against strong business groups. The adivasi lands are rich in minerals that industry covets. The film captures the adivasi's reluctance in leaving the only way of life they know. 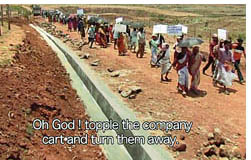 But eviction looms large: big businesses most often have it easy, because the adivasi do not have land deeds. And the stage is set for violence, against people as well the ecology. Most adivasi communities practise agriculture with a system of crop rotation, under which land is farmed for three years and then left fallow for a couple of years to regain its fertility, mining involves digging away soil, making it infertile for generations. Vinod Raja gets the film's message through without much slapdash. The simplicity of the shots is remarkable. For example: shots of a mining conference, where all the business deals are made, are juxtaposed with the scenes from the remote areas where the decision will actually be implemented. There is a stark contrast between the area where theadivasi live and collect their mahua, singing eulogies to the tree, with the area where the coal is mined. The twang of Saloo's instrument today gets drowned against the angry growl of the miners' trucks. The alienation of the adivasi in their own appears in its grim reality. The chief minister arrives in his helicopter, delivers a speech on land rights, and disappears; the film offers no commentary, only the visuals. Yet it gets home the point. The film travels to several mining sites, proposed or ongoing. It also showcases adivasi arts, ancient cave paintings, and the people who live with them, for whom it is the way to understand their world. There are repeated references to the the mahua tree, the life giving hill, the water. In each area, the adivasi are ready to go to any lengths to protect them. The editing could have been tighter. It is a tad repetitive, which sticks out especially at the point showing the violent side of the adivasi movement. Perhaps a good ending for the film would have been the statement of the woman whose husband got killed in police firing: "We say we will die for the land. But is the land being saved by our deaths?" One is left wondering.